The year 1912 was only the second of Harley-Davidson twin-cylinder production, although they had appeared in H-D’s press as early as 1908. There’s no evidence a twin-cylinder machine was actually sold by the factory until the 1911 model 7D, which differed significantly from the 1908 racer and 1909 Models 5-D (a roadster) and 5-F (the racer). H-D claims 27 of the Model 5 machines were built, but they were likely used for promotion or racing only; no mention of a twin-cylinder model appears in H-D parts books until 1911. As well, the 1908-09 twins used 'atmospheric' inlet valves (i.e. activated by piston suction only, with no camshaft or pushrod), which gave erratic performance in any but a full-throttle position, which would not have suited Harley's already established reputation for reliability and strong running. No V-twin was mentioned in 1910, but in 1911, a twin reappeared as the Model 7D, which was significantly improved over the old 'atmospheric' machines. Now both valves per cylinder were camshaft operated, and as Harley claimed in its brochure, '"Exhaustive experiments covering more than four years have proved that it is impossible to get satisfactory results, particularly at low speed, from a twin-cylinder motor which is equipped with the atmospheric type inlet valves. The very design of the twin-cylinder type motor is such that induces misfiring at low speeds. Automatic valves give perfectly satisfactory results on single-cylinder machines, but the twin proposition is altogether different," and further, "only features which have shown their real merit in actual road service will be found in this machine." 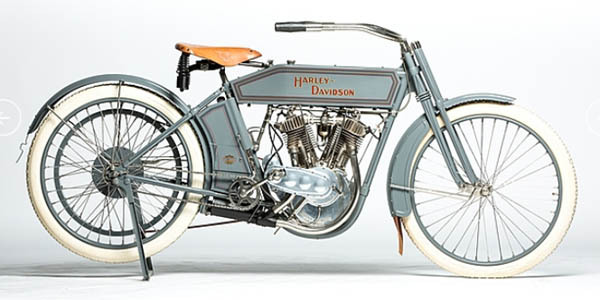 Thus we can see our way to safely conclude from the confusion of first-appearance dates, experimental prototypes, promotional machines, and non-production racers, that the 1911 7D is indeed the first 'production' V-twin from Harley-Davidson, and represents the dawn of a remarkable era in motorcycling. The twin-cylinder H-D had its own frame, distinct from the single-cylinder models, which by 1912 had become a straight downtube as well. Its flat leather belt had the tensioning wheel (or 'idler') introduced for the 1910 singles, which enabled a rider to keep the engine running while at a stop, although of course one risked burning the belt if stopped too long! The top of the cylinder casting now had vertical fins for better cooling and an oil tank sharing the space previously occupied by the toolbox. The magneto had been moved in back of the engine by 1911, out of the path of road grit and water; and in the same vein, Harley applied for a patent for fender skirting which extended over the left side of the wheel, to protect the drive belt from slung mud and water, which caused slippage. 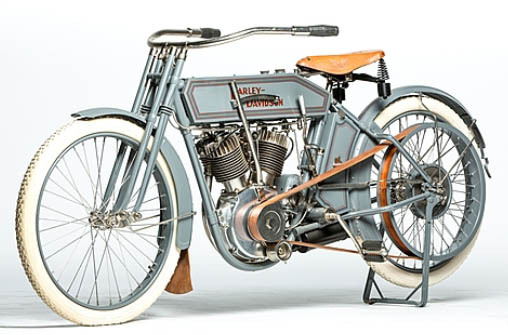 This 1912 Harley-Davidson Model 8A is a very rare and very early twin-cylinder model with a belt drive and idler wheel. It was restored from a complete and original machine and was purchased in California.